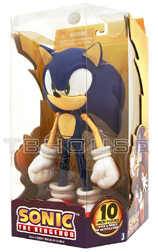 This page has general release by Jazwares. Due to not really having a 'line' other than the Juvis and the 3.75 inch figures, this page covers all the rest. Product UPCs SKUs also appear here for easy-calling of the store near you. *Note: Toys R Us has an exclusive on these for a LIMITED TIME only. These are all fall 2009 and later releases. (see other pages for earlier figures) TRU stores in Canada and Australia should have these figures as well. Call your stores for availability! 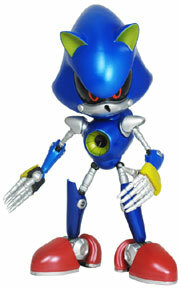 Here's the debut of their first 10 inch figure, Metal Sonic. 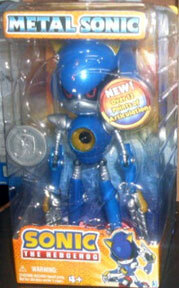 Metal Sonic has always been a fan favorite with way too little merchandise. 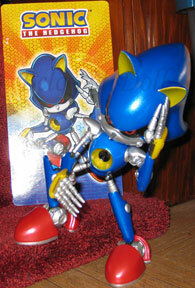 Jazwares sets out to fix this by releasing this spectacular action figure. It's 10 inches high and has at least 12 points of articulation. The box seems quite nice as well, being mostly clear so you can really get a good look at the figure even if you keep it MIB. 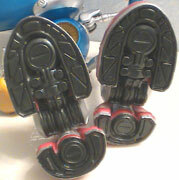 The "R" sticker for TRU exclusives is metallic tone silver, and the other tells about the articulation. This figure can really hold poses, despite the size! The price should be about $16.00 --which is great for something of this size and detail. Articulation Information: There seem to be 18 joints total. Neck, shoulders (cuff and rotator), ankles, elbows, wrists, fingers (set), thumbs (flat), hips, knees and ankles. The ankles swivel sideways, even though there is a BIG joint sculpted into the detailing. The legs are placed on somewhat oddly, they swing out side to side, and are put in at an angle, so they also swing forward and back. It's not as free moving as the 3 inch line, but not as restricted as the werehog. With these angles, you can see he looks good from any direction. All the paint has a metallic sheen to it, but the blue is most obvious. The eye black is very glossy, helping it look like glass. They detailed in the engine in his back nicely as well. 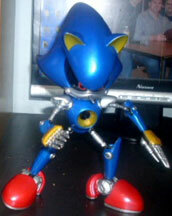 The face shot shows that the silver lower-jaw part does not go all the way back to the neck like it did in Sonic CD, but this may be another version of him, and he still looks fine. All photos in this area provided by Beloved Doll. The box is mainly the clear plastic shell and part to hold him in, so he can be seen from most angles of display, even if he's still boxed up. The box back is a piece of cardboard with a large version of the art on it. This can easily be removed to help you display him (as shown). The front of the box plastic has a raised 'spin' design which mirrors that seen in the art (left) again helping the box to stay hard to fake. While none of the other fingers move independently, the thumb will indeed swivel, as seen above. The other fingers can move foreward and back as a whole to help you pose him. Even the bottoms of the feet are highly detailed. It should also be noted that the feet are extremely heavy. This certainly helps him stand, but the figure will absolutely not pose with a leg up unless it's supported by something. 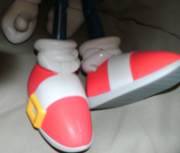 The largest joint in the whole figure (The sculpted ankle/foot-middle) is also the joint which does not move (even though it looks like it would) If it did, he could raise his toes or heels independently. Metal screws are used to add sturdyness to the joints, a great plus. 1. Wilting appendages- The upper arms and thighs are made of flexible rubber. The lowers and feet are not, so if you pose this with the arm or leg out the rubber part will actually bend or wilt. Beware. The only fix for this that would have been sturdy enough would be to use actual metal to make the piece. 2. Single paint flaw- There should be a white stripe horizontal around the whole edge of his shoe. There isn't. It's not like the chin silver vs chin blue issue where the art does not confirm or deny it, the modern MS art clearly has the stripe, this figure does not. FIX? 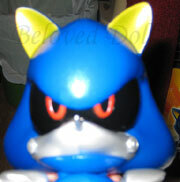 SOME newer versions of him do have the chin paint silver that goes all the way to the neck. It should also be noted that the thumbs can break, they only rotate, and do not lift. BUY THIS. Buy it now. It is totally unbeatable for size, price and detail. It will likely become outrageously expensive and hard to get as soon as it leaves the shelves. You will only want it more if you don't have it by that point. The picky things are just that, little picks that don't matter. It may not be on scale with anything else but it is just too cool to pass up. This thing lived up to everyone's expectaion, Jazwares has created a real winner here. 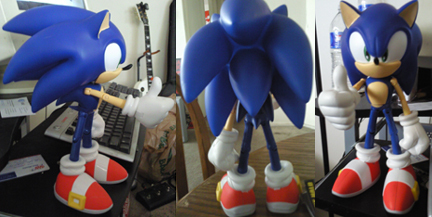 The articulation is great, ESPECIALLY the wrists which are ball-jointed so it's pretty much like a real wrist. 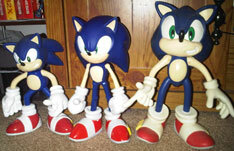 Some figures may have REALLY stuck joints but once they move once, they're fine. The shoulder cuffs are this way too. Hip movement is fine, but the sheer size of this makes him heavy & difficult to hold any extreme pose. This is totally size/ratio dependent, no joint can hold such weight at odd angles. It must also be commended for NOT including a mouth. Some of the art used a little wedge shaped hole for a mouth, it would have just looked bogus here. All the paint is pretty much fantastic. Metallic/glittery and neat. No wrong colors, everything's spot on. No one reports overspray or paint flaw problems. The fingers are all the same length? Yes they are. The original MS (who just had streight 'claws') had this as well. The official art makes it impossible to tell, but it has to be assumed 'yes' from the render, so that's accurate too. It should be noted (but not by Dr Eggman) that species have different finger/claw lengths to facilitate better gripping! The eye goes back behind his ear? Yes it does. The eyes are extremely wide. The original MS had an eye width about equal to Sonic's but again, the modern render was used for this guy, so that's accurate too. Could it be improved upon? Yes. Stiffening/metal the upper arms and legs. If that were to be done at any size figure, you'd have pretty much the perfect figure with perfect articulation. Robots lend themselves really, really well to accurate figures for obvious reasons. But just because something could be improved it doesn't diminish the one that does exist. By all means, get this guy! 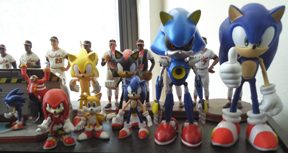 If there's a 10 inch Metal Sonic, why not a 10 inch regular Sonic? 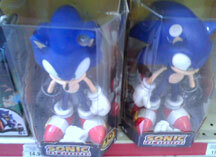 Here's Jazwares' answer to the ReSaurus "Giant Talkin Sonic". This one doesn't talk, but it also does not look psychotic...which is quite a plus. From this early shot, it looks like it'll have a nicely windowed box with some die-cutting to add interest to the sides. The dot on the bottom tells you how big he is, and talks about the articulation, which is 'over 12 points'. This should be about $15, and releases in fall 2010. 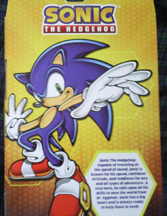 The box back has a rather dynamic large stock art, as well as a nice profile for Sonic. With this turn around, you can see he's just as well sculpted as their smaller line figures, however, he's not a clone of them, either. They've changed his hand to 'thumbs up' to add interest, and have lowered the waist joint so it doesn't disrupt his belly-dot color as much when turned. 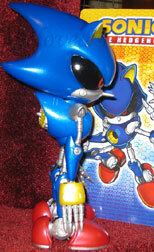 Clearly, he can stand on his own, as well as hold his arm out, so the joints aren't too loose. 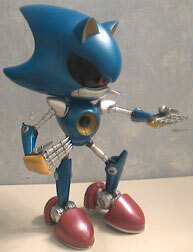 They've also added ankle & wrist joints that the smaller figures don't have, so he's got extra articulation (as seen in the photo below) This figure is actually slightly larger than their 10 inch Metal Sonic, for some reason.